A one day introduction to riding in an off-road environment. BYO Bike or choose our training with hire bike option. 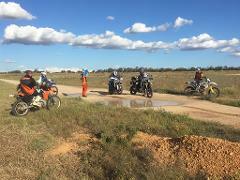 A one day introduction to riding in an off-road environment including bike hire. Improving your understanding and ability for unsealed surface riding. BYO Bike or choose our training with hire bike option. Improving your understanding and ability for unsealed surface riding. Including bike hire. For the more advanced rider who’s wanting to improve their riding skills in certain areas (High speed). BYO Bike or choose our training with hire bike option. Improving your understanding and ability for unsealed surface riding. Including Suzuki DR-Z400E bike hire.